Fourth in a series, following Stuart Reardon, Xabi Alonso, and Pablo Daniel Osvaldo, is Leo Rico, a male model and real-life firefighter from Spain. Yes. That's right, everyone. 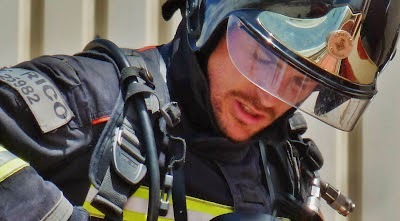 He is a bombero. What is it about firefighters? They're real-life heroes, warriors whose job is to preserve life and property rather than to destroy it. Ah, but let me not get too poetic here. The photos should speak for themselves. Feeling hot yet? Image from miblogdemodachic. He's got this Jonathan Rhys Meyers smolder going on, but I think that's from the eyes. He's less ethereal and a lot less pretty than Meyers. Less pretty, more...sigh. Image from lelima.com. Jeans and a smile. Image from 7pekados.com. Here's a photo of him wearing a shirt, just for variety's sake. Those forearms! Image from 7pekados.com. Bringing "Blue Steel" to the mountains. Again, look at those lethal forearms. Image from leorico.blogspot.com. It's too much. *faints* Image from miblogdemodachic. The man is a walking romance novel. Image from leorico.blogspot.com. He'll get your kitten out of that tree. Image from miblogdemodachic. Leo Rico has appeared on the cover of Men's Health in Spain. Here's his cover. Glad to know that "Six Pack" is the same in English and Spanish. Image from gpssoluciones.es. Here's the video they shot to promote the cover. You might want to get your cigarettes ready for afterwards.